Residents can expect to see a flurry of activity in the new few weeks to repair damage from the record 2017 spring freshet. 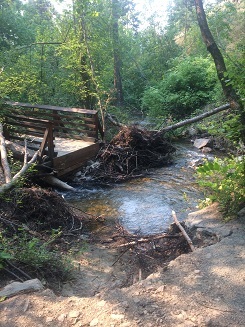 Starting Monday, April 1st, crews will be working on two prefabricated bridge structures to replace those that were damaged in Hardy Falls Regional Park just off Highway 97 at the south end of Peachland. The park has been closed since Deep Creek overflowed its banks, severely damaging two bridges, bridge approaches and the trail. When reconstructed on a nearby vacant property and when weather permits, the bridges will be airlifted into the park. Following that, it’s hoped trail repairs can be made by early May and the park will be open again to visitors. The Provincial Disaster Assistance program provided $48,400 to repair damage to this park. As well, next week it’s anticipated that site preparation work will begin in Killiney Beach Community Park, at the end of Hodges Road in the Central Okanagan West Electoral Area. Paving of the access road is slated to begin around Wednesday, April 10th. Last fall, upland recovery work was completed and this month saw installation of a new replacement dock. 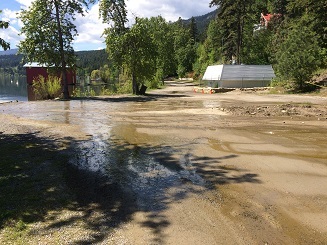 It’s anticipated in June, crews will return to the park to stabilize the concrete boat launch pads that were damaged by the 2017 record high Okanagan Lake water levels. The BC Disaster Financial Assistance program provided $330,000 for damage repairs while the Community Works Gas Tax Fund provided $180,000 for other improvements to this popular North Westside waterfront park. You can keep up to date with the status of several other Regional Parks recovery projects by visiting www.regionaldistrict.com/parksfloodrecovery and on the RDCO website Major Projects Map. 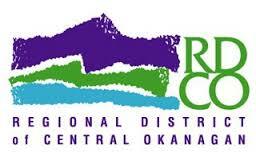 The Regional District protects over 2,100 hectares in 30 regional and 20 community parks for the enjoyment of all Central Okanagan residents.